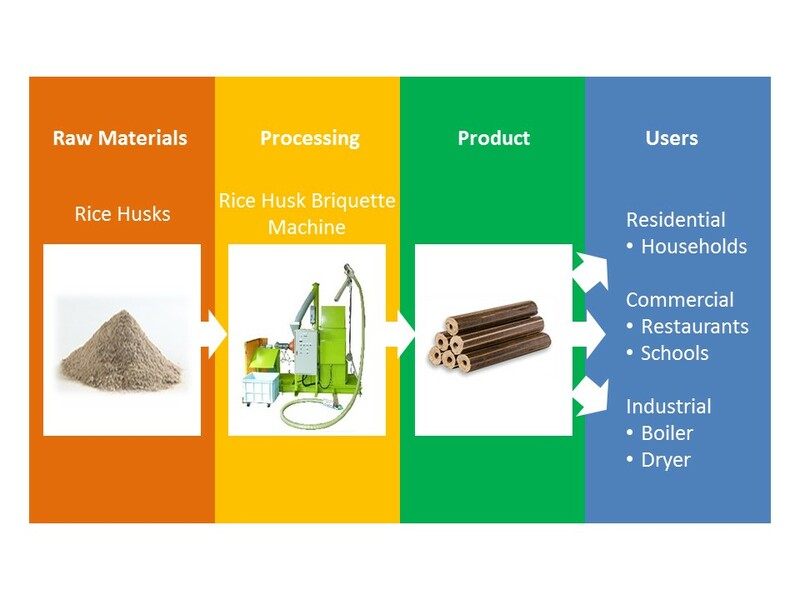 Tromso Co., Ltd.’s rice husk briquette machine (called the Grind Mill) uses often-underutilized rice husks to produce useful fuels. It works via a machine that grinds and compresses rice husks, producing solid briquette fuels called “Momigalite”. No binders or adhesives are needed, which represents its greatest feature. Momigalite can be used in place of firewood or charcoal, boosting forest preservation efforts. The machine was first created based on ship-building industry technology in Hiroshima, Japan. Due to the high level of silica in rice husks, core parts typically wear out easily with conventional machines. However, Tromso’s technology utilizes a special metal applied to the surface for added durability. Momigalite can be used as a substitute fuel in the event of a disaster, and this technology can be utilized in residential households, commercial restaurants, schools, etc. The rice husk briquette machine has core parts that are extremely robust and durable, contributing to a long life span. This results in the ability of the machine to operate for 400 hours before replacement is required. Conventional parts, on the other hand, will wear out after 24 to 48 hours of operation. The rice husk briquette machine is capable of producing 120kg of solid briquette per hour, which equals about one ton in eight hours. In just one year, Japan burns or disposes of 2.5 million tons of rice husks. Around the rest of the world, 200 million tons of rice husks are discarded or burned. This technology allows those natural resources to be used for a sustainable purpose. Momigalite is simple to prepare and use, leading to dependability in any environment. In addition to rice husks, this technology can also be used for corn husks. Moreover, the company has begun experimenting with peanut hulls. This will allow the equipment to make a humanitarian contribution to areas in Africa affected by fuel shortage, famine and poverty. Experimentation with peanut hulls is still in the development phase. Since 2007, Tromso has made rice husk briquette machines, selling more than 70 machines, with 15 machines exported to Tanzania, Nigeria, China and Vietnam. 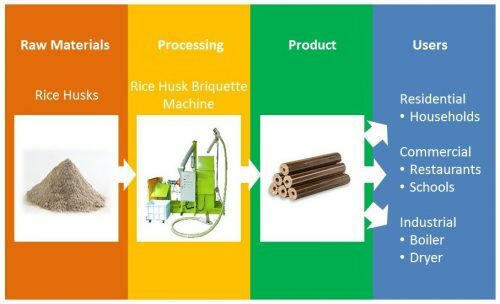 The rice husk briquette machine can produce useful fuels by using often-underutilized rice husks. The machine grinds and compresses rice husks with heat producing solid briquette fuels without using any binders or adhesives. The rice husk briquettes can be used as substitutes for firewood or charcoal, which contribute to forest preservation. The competitive advantages of the rice husk briquette machine are the robustness and the durability of the core parts. The machine was developed based on the shipbuilding industry technology in Hiroshima, Japan. As rice husks contain high level of silica, core parts are normally worn out easily. At Tromso, special metal is applied to the surface of the parts so that the parts become durable resulting in the ability of operation for 400 hours before replacement while conventional parts without this surface treatment will be worn out in 24 hours to 48 hours. The machine can produce 120kg of solid briquette per hour (approximately one ton in eight hours). Tromso has manufactured rice husk briquette machines since 2007 and already sold more than 70 machines since the establishment. We have exported 15 machines to Tanzania, Nigeria, China and Vietnam. * Tromso Co., Ltd. and E-Square Inc. (2014) “Project Formulation Survey” under the Governmental Commission on the Projects for ODA Overseas Economic Cooperation in FY2013 Final Report Tanzania: Study on an Introduction of Rice Husk Briquette Machine Summary Report. Although we do not experience difficulties in operating the machines, the users have to find market for rice husk briquettes by themselves. Also, the availability and affordability of rice husks are important for the constant operation of the machine. We can train local engineers so that they can assemble, operate and maintain rice husk briquette machine. Tromso also can export parts which cannot be fabricated or sourced in your country and support you on-site to assemble the machine in your country.